BARGAIN! PRICE REDUCED/55+/79/2BD2BA/NEW ROOF/NEW AC/1440 SQ HUGE! Now this is not your typical manufactured home, this one has had all the essential maintenance updates completed for you. You wont worry about the roof on this one as it is all new metal roof over guaranteed by the Knox Aluminum company, the AC is new, the water heater is new, the home has been re-plumbed all new, reverse osmosis drinking water system, water softener, and ceramic tiled storage and laundry area complete with washer and dryer and tons of shelves for storage. The kitchen appliances have been updated to include a 3 year old range oven, and a new refrigerator this year, This is a large two bedroom home offering extremely large rooms due to its size and two bedroom floorplan. The fully furnished master suite complete with included linens spans the entire rear of the home, offers an exit door out the back for emergency use, a huge walk-in closet, a large master bath full of towels complete with vanity and a molded one piece shower kit. The main bath is stocked with towels and cloths, offers two vanities and sports a one piece tub shower combination unit, just across from the main bath is the oversized guest bedroom complete with it's own walk-in closet. Entering the home from the side door off the painted drive you enter into the formal dining on the right with the sweeping fully furnished kitchen on the left complete with an eat on breakfast bar separating the kitchen dining area from the living room. This kitchen is again extremely large and offers tons of cabinets for all the kitchen gadgets and necessities already included in this sale, towels, pots, and pans, silverware, small appliances, portable microwave, toaster oven, theses are just a few of the things that complete this wonderful kitchen. Just outside the kitchen is a formal dining area and just off the dining is the living room. 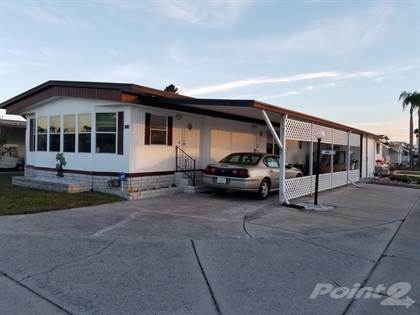 Located off the living room is the front attached added Florida room professionally installed and under the homes central air system, this room spans the entire front of the home and measures 12X21 complete with windows and custom blinds. This home is in excellent condition, includes al the window coverings, and is located on a corner lot in the Hawaiian Isles 55 plus community offering full compliments of the active senior lifestyle including a year round heated swimming pool, hot tub, shuffleboard courts, horseshoe pits, kayak launch on the cockroach bay, fishing pier, nature trails, RV/boat storage island, large boat launch on cockroach bay one mile. Hi, I'd like to find out more information about 4128 Aloha Blvd. Thanks so much!